Stapled deals, such as Palamon's recent transaction involving three of its funds, increased during H1 2015, according to a report by Setter Capital. Stapled deals are on the rise as general partners use investors’ interest in existing funds to boost fundraising. A report by Toronto-based intermediary Setter Capital showed that almost a third of respondents to a survey it conducted felt a higher number of GPs sought staples in the first half of 2015 compared with a year earlier. 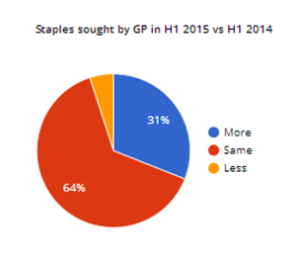 Two thirds of respondents to the survey felt the number of GPs seeking staples had stayed the same, with 5 percent saying the number had dropped. “In this market where quality deals are hard to come by, and the fact that there are so many players who have raised such large funds that they need to put larger dollar amounts to work for a deal, stapled transactions are a really good way to increase the size of a deal,” said Sunaina Sinha, a partner at Cebile Capital, a placement firm in London. With good GPs, buyers realise if they don’t do a staple transaction, they won’t get access to the secondaries, she added. Last week, Secondaries Investor reported that Palamon Capital Partners had closed a stapled deal in which five buyers including Goldman Sachs, Morgan Stanley and Adams Street Partners had purchased stakes in two existing funds as well as made commitments to a new fund.